KUALA LUMPUR (Dec 27): Genting Group’s run of bad luck isn’t ending. This time, Genting Bhd’s indirect wholly-owned subsidiary that is developing the Resorts World Las Vegas property located in Las Vegas, has found itself entangled in a lawsuit with US-based casino operator Wynn Resorts Holdings LLC. According to news reports yesterday, Wynn Resorts is suing Genting’s unit Resorts World Las Vegas LLC (RWLV), claiming similar architectural design in Resorts World Las Vegas’ hotel and casino to Wynn Las Vegas, Encore and Wynn Macau. “The architectural design embodied in the defendant’s Resorts World Las Vegas hotel and casino is substantially similar to plaintiff’s registered copyrighted architectural work, and therefore [the] defendant is violating plaintiff’s copyrights in addition to plaintiff’s registered and common law trade dress,” Las Vegas Review-Journal reported the lawsuit as saying. Shares in Genting and its 49%-owned subsidiary Genting Malaysia Bhd (GENM) tumbled yesterday after the news broke — with no reprieve from the Christmas break. Genting shares closed at its intraday low of RM6.02 — making it one of the top losers on Bursa Malaysia, down 21 sen or 3.37% from Monday’s close of RM6.23. Its market capitalisation is now RM23.18 billion. A total of 3.3 million shares crossed hands. Year to date (YTD), its share price has fallen 34% from RM9.08, which translates into a market capitalisation loss of RM12.43 billion. GENM shares were not spared, falling as much as 3.6% to touch an intraday low of RM2.92 in early trade, before settling at RM2.95 – still down eight sen or 2.64% from Monday’s close of RM3.03. A total of 18.41 million shares were traded, making it one of the most active stocks on Bursa yesterday. YTD, GENM has lost RM16.09 billion in market value to close at RM16.68 billion yesterday. The counter has fallen almost half or 49% since the beginning of the year, from RM5.57. In an immediate response to the reports yesterday, Genting confirmed that RWLV had notified that a complaint dated Dec 21, 2018 was filed by Wynn Resorts against RWLV alleging trade dress infringement, trademark dilution and copyright infringement over the design of RWLV’s upcoming hotel and casino resort property. Genting told Bursa that RWLV will file a response to Wynn Resorts on or before Jan 14, 2019, the due date for a response. “RWLV is reviewing the complaint with its legal counsels and will strenuously defend the claim and take all necessary legal action, as appropriate. “[Genting] will make the necessary announcements as and when required on any material development of the matter,” it added. According to Las Vegas Review-Journal, at issue is the similarity of the architectural trade dress of the buildings. “On properties in Las Vegas, Macau and Everett, Massachusetts, Wynn used a concave facade with curved bronze glass coupled with horizontal cream-coloured banding above and between the lines of glass panes,” the report said. The lawsuit is said to have included photographs of design elements in the multibillion-US-dollar Genting scheme, which is due to open in 2020. 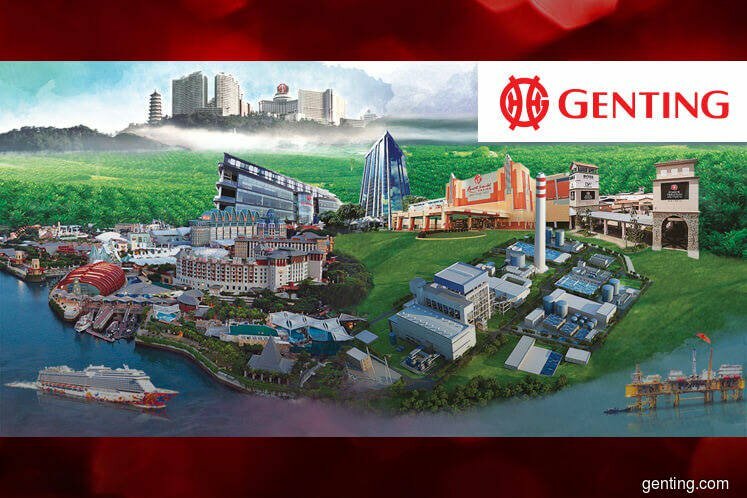 On Nov 27, GENM announced that it was suing Fox Entertainment Group LLC and The Walt Disney Co for US$1 billion (RM4.18 billion) for terminating an agreement to develop a Twentieth Century Fox World theme park in Genting Highlands. Disney is in the midst of acquiring Fox for US$71.3 billion. As a result, the opening date of GENM’s most anticipated new outdoor theme park is still up in the air as the group is still considering various options for it. Earlier in November, Budget 2019 served as bad news for Genting and GENM after it was revealed that casino duties will be revised up to 35% over existing duty rates. Also, the annual casino licence fee will be revised from RM120 million to RM150 million effective Jan 1 next year. And on Nov 30, Genting swung to a third-quarter net loss of RM275.8 million — its first quarterly net loss in 10 years — versus a net profit of RM190.04 million a year ago, no thanks to an RM1.83 billion impairment loss on GENM’s investment in the promissory notes issued by the Mashpee Wampanoag Tribe. At the same time, GENM announced its largest quarterly net loss of RM1.49 billion for the third quarter ended Sept 30, 2018. Despite these headwinds, Genting remains a popular stock pick for analysts. Bloomberg data showed that out of the 16 research houses that cover the stock, 12 of them have a “buy” call and the remaining four have a “hold” rating. The target price ranges from RM7.12 to RM10.90. Meanwhile, GENM has five “buy” calls out of 20 research coverages, while nine have a “hold” rating and the remaining six calling a “sell”. The target price ranges from RM2.70 to RM3.80. This article first appeared in The Edge Financial Daily, on Dec 27, 2018.